I have reviewed your site and loved the new look! In all, a beautiful presentation and I particularly liked the photos of the Dolomites. Your site is a fine example of the quality I am looking for in my Award program. We are pleased to inform you that your site, Barbara Tampieri Home Page, has been awarded the Level 2 Award. We applaud the high quality artists that you feature on your site and your unique presentation style. Many of the pages on your site have a professional flavor. It was a lot of fun to visit the site, and we will be back every month to see the new featured artists. Ann Bevans and Dave S.
I have the pleasure to inform you that your site has been reviewed and found worthy of an Arete Wave Award for excellence! Review Comments: Wow. What impressed us most was the design ... stunning and very much befitting of a fine art site. On a personal note, the site was VERY close to the next higher level. Your site was indeed a pleasure to surf through! Please accept congratulations on an awesome arete site! I thank you for applying for my award and allowing me to visit and to review your fine web site presentation. I wish you the best of luck in your future endeavors. Once again, my congratulations to your contribution of creative design and rich content to the World Wide Web. Congratulations on your achievement! 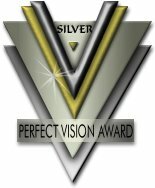 I am pleased to present "Barbara Tampieri Home Page" with the Perfect Vision Silver Award. Your elegant and skilful presentation of unique content ensures your status as a creative visionary. For your records, this award is presented from Canada and is rated 5.0 by Award Sites! Thanks again for your participation in this program, and for affording me the opportunity to evaluate your excellent website. I extend my sincerest congratulations to you for the hard work you invested in creating a great web site. Your site, Barbara Tampieri Home Page, has won the 24-7 Web Designers Arrow Award for web site design and content. You have an outstanding flash driven website, professionally designed with easy to follow navigation. Your site has a good contrast in color of text to background and asthetically pleasing graphic designs. Your site should be considered one of the top 5% Web Sites on the Internet today. Once again congratulations, and keep up the great work! We are pleased to notify you that you have been pre-approved for our new awards program. The purpose of this award is to recognize creatively-designed web sites that offer great content and information. We will strive to make this one of the most sought-after and exclusive awards on the internet. And, we believe this will create an accessible community of the finest galleries and shops on the web. Walter Spalding for Hidden Beauty Gallery. I visited your site several times - always for a long time. Looking at all the pictures, playing puzzles, visiting the art gallery ... it was a very enjoyable time. The site is well designed, easy to navigate and is properly shown with Internet Explorer and Netscape Navigator. For your good work I would like to present you my Silver Nugget and hope that you accept this little token of appreciation. 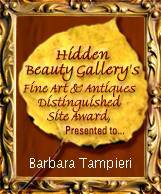 Thank you for allowing me to evaluate your site "Barbara Tampieri Home Page". Following the evaluation I am pleased to inform you that your site has achieved the 3 Star Soft Gem Award. The "3 Star Award" is given to those sites achieving a score of 93-100. This Award represents excellence in design and content.Your site had a very distinctive character,spirit,and attitude which is the main focus of The Soft Gem Award. This Award means automatic nomination for the "Site of the Month Award". ich freue mich, Dir f�r Deine Homepage: http://digilander.iol.it/barbaratampieri/ den BoA Award mit 2 Sternen �berreichen zu d�rfen. Gern m�chte ich meine Entscheidung begr�nden. Du stellst auf Deiner Webseite verschiedene K�nstler vor. Die Pr�sentation der Bilder ist sehr gelungen, besonders die einzelnen Informationen zu den K�nstlern sind sehr informativ. Beeindruckt hat mich Dein schlichtes, aber sehr edles Design. Die Navigation ist durchdacht und leicht zu bedienen. Auch mit dem Netscape Navigator ist Deine Seite problemlos anzuschauen. Dein Postcard Service, sowie die Informationen und Bilder �ber die Dolomiten sind ein weiteres Highlight Deiner wunderbaren Seite. Nat�rlich habe ich mir auch Dein eigenes Awardprogramm angesehen. Es ist absolut vorbildlich , sehr gut gefiel mir das Dein Awardprogramm in 3 Sprachen gef�hrt wird. Es ist mir eine Ehre Deine Seite zu den Gewinnern meines Award z�hlen zu d�rfen und ich w�rde mich freuen, wenn Du den Award als Zeichen meiner Wertsch�tzung f�r Deine gelungene Webpr�senz annehmen w�rdest. Congratulations from The Castle Raven. It is my pleasure to award you with the Raven Silver Award of Excellence�. It was a pleasure to visit your site. The amount of content was staggering and very informative and beautiful. This is a site that any artist would be thrilled to be showcased on. The navigation was concise and user friendly, the design fit very well with the large amount of content and the colour theme was very appealing. It was easy to linger and we did for some time. We will most certainly continue to visit your site and look forward to all the future endeavors and new artists to display there. Thank you for affording us the privilege of reviewing your site. Again, congratulations from everyone at the Raven Awards�.